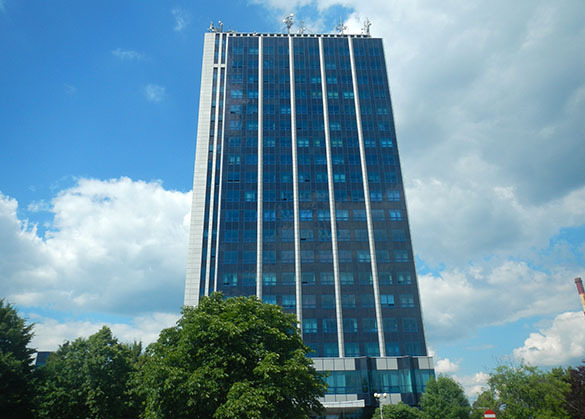 SOSNOWIEC, POLAND — On my last full day in Poland, Michał Zatoń and his family took me on a tour of the city they live in and where my hotel is located: Będzin. 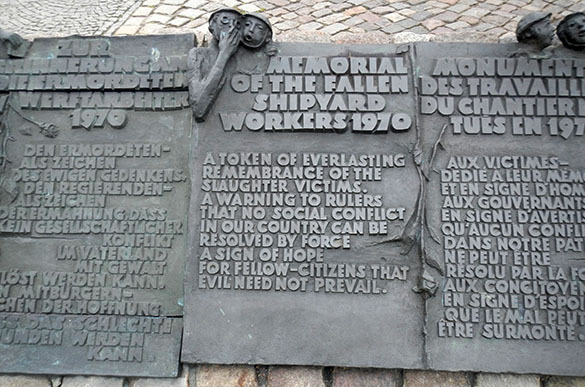 The history of this place is very long, stretching back to the Neolithic, and for us it is dominated by World War II and the horrifying events that took place here from the earliest days of the war in 1939 until its liberation from the Germans in 1945. 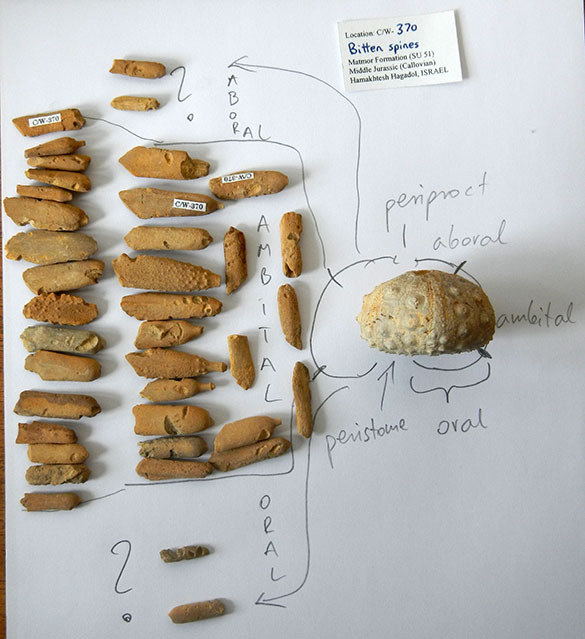 I thought I’d highlight one part of that history recently excavated and with a geological context. 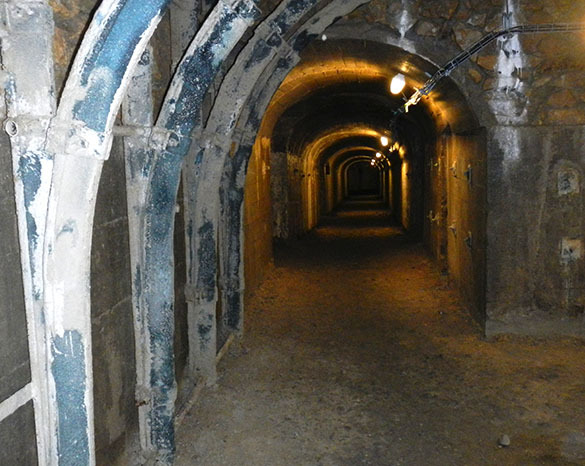 The above view is looking down a tunnel in a complex bunker constructed by the Germans in 1944. Its purpose was to serve as a refuge from Allied bombing and reconnaissance flights near the end of the war. 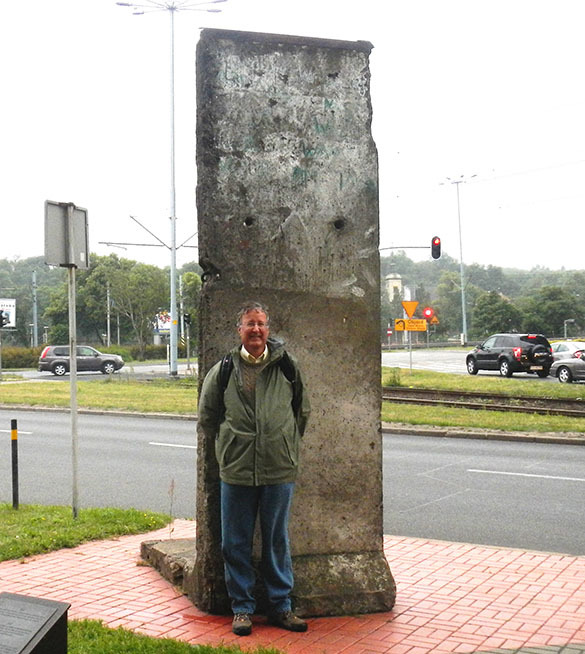 It had been sealed off and all but forgotten after the Germans retreated in 1945. 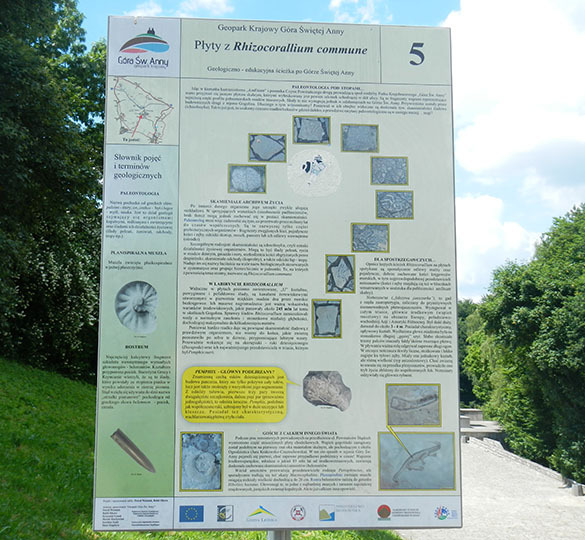 The city of Będzin is now excavating it to be an underground museum. We were fortunate to have a private tour this morning. These are the street level entrances into the bunker complex. You can see the solid rock outcrop behind the doorways. Much of the bunker is unfinished, like this portion. The steel arches are the modern effort to stabilize the roof and walls to make it safe for the public. The Germans left in a hurry. 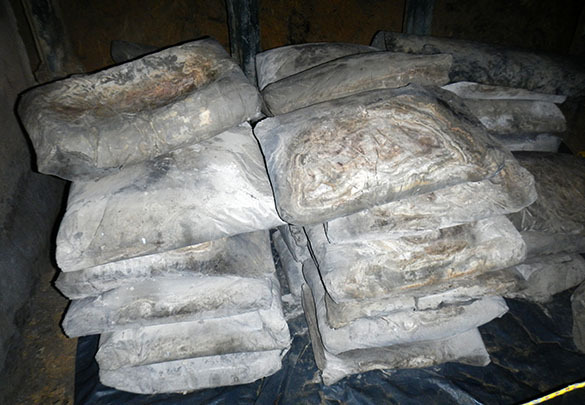 This is a pile of unused bags of cement mix. In the decades since they were placed they have essentially fossilized into solid masses of concrete. This is the leading edge of construction where the concrete was laid against the rock wall. The reddish-yellow limestone is the Muschelkalk (Middle Triassic) unit we visited earlier this week. 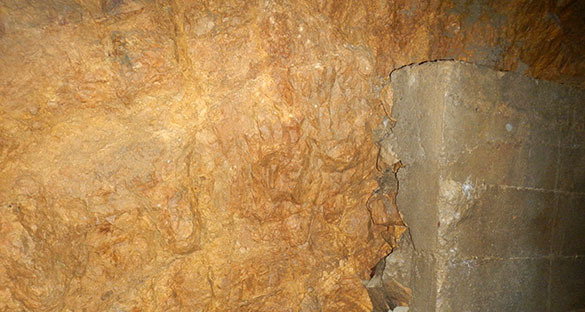 This is a strong rock suitable for tunneling because it can be easily carved out. This interval is probably equivalent to the crinoid-rich top of the Muschelkalk. This is one of the few photos made at the time in 1944 when the bunkers (although unfinished) were opened for use. It is taken from this website (in Polish). 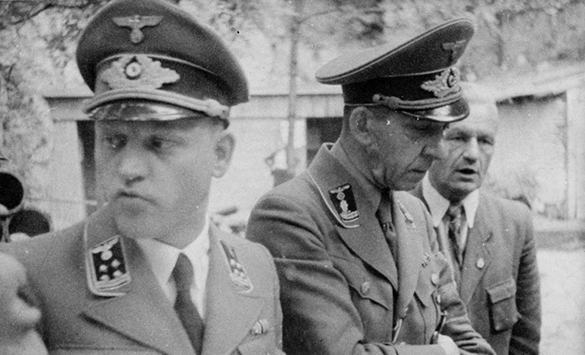 The man on the left (Hans Kowohl) was the mayor of the city, and the one in the middle was reportedly hanged as a war criminal in 1946, although I can find no mention of his identity. Thus ends my Polish experience this summer with great colleagues, wonderful rocks and fossils, and a deep, often disturbing, history. I was challenged on many different levels. Castles in Poland I expect, but a desert? 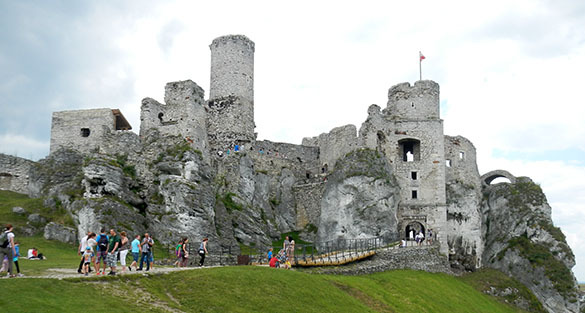 SOSNOWIEC, POLAND — Today my colleague Michał Zatoń took me and his family (wife Aneta and son Tomasz) on a tour of the Polish Jura, an upland with spectacular exposures of Jurassic rocks and the castles who love them. 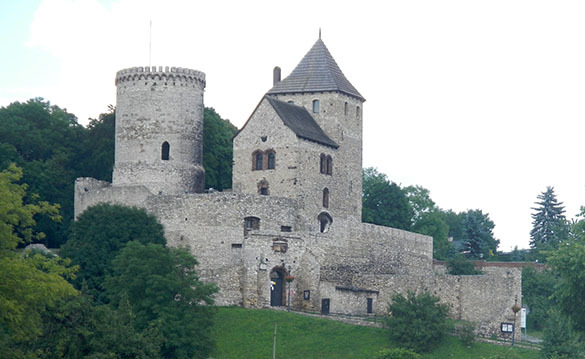 Above is the castle I consider most dramatic: Zamek Mirów from the 14th Century. Note the large mass of white bedrock at its base. 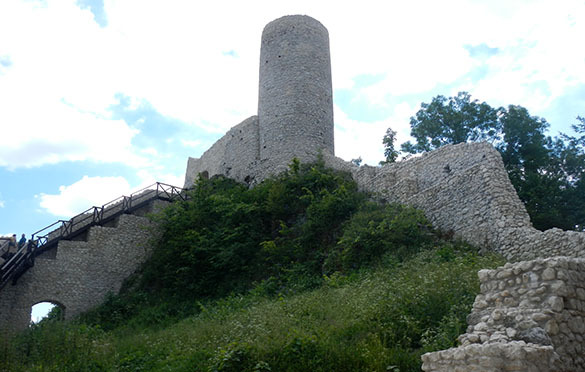 This is a natural outcrop on which the castle was built. This will be a theme. Here we see a series of these white rocks jutting dramatically across the landscape. 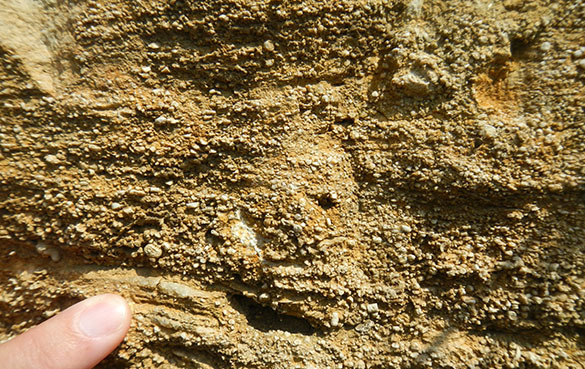 They are Upper Jurassic (Oxfordian) sponge-rich silicified limestones that grew as bioherms (organic mounds) on portions of seafloor elevated because of igneous intrusions below. The sponges loved being raised off the deep seabed and continued to grow upwards. Since many of them were siliceous sponges, after death their silica was mobilized into the surrounding sediment as a cement. This process produced these outcrops of very hard silicified limestones just waiting to host a castle or two. Conveniently, the rocks can be quarried to produce the stones used in castle construction. 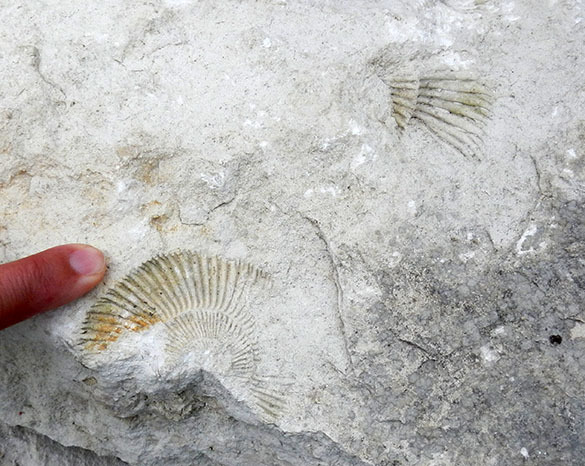 Fossils are quite common in the building stones, like this ammonite external mold. 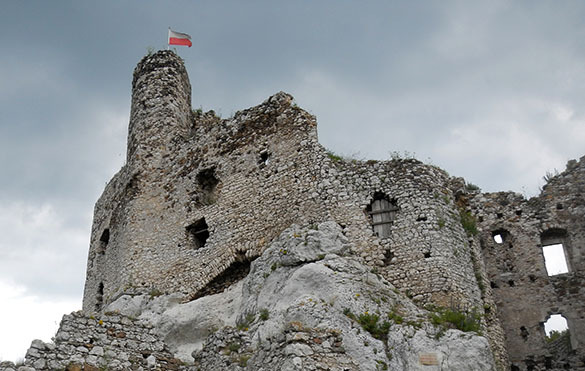 Zamek Smoleniu was the smallest castle we visited, but somehow the scariest to climb. Getting to the top of that tower was a challenge. 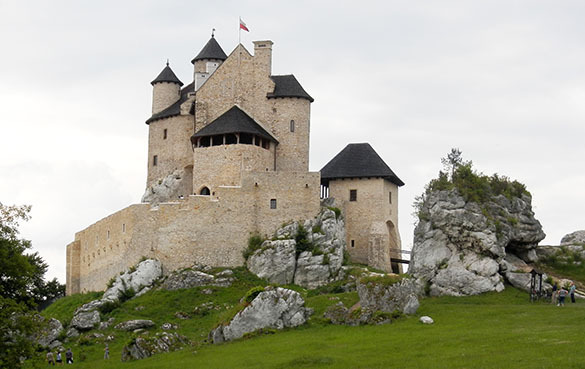 Zamek Ogrodzieniec was the largest and best known castle we visited today. It is haunted, but I ain’t scared. 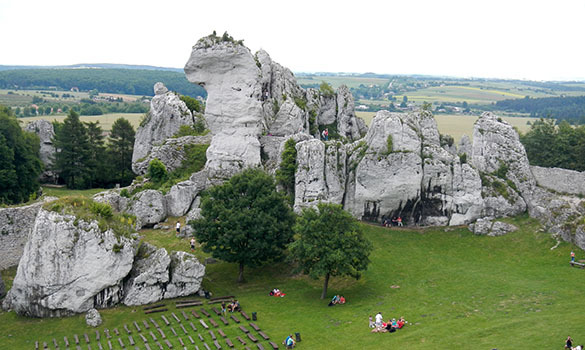 The outer fortifications of Zamek Ogrodzieniec have very impressive outcrops of the Oxfordian silicified limestones. Now what about that mysterious Polish desert? Well, turns out it isn’t a desert in the official sense (it receives a lot of rain), but it sure looks like a desert. Pustynia Błędowska is its name in Polish. It is definitely an odd patch: 32 square kilometers in the midst of rich Polish pine forests. This place is so deserty that the German Afrika Korps trained here before going to northern Africa, and the Polish military uses it as a proxy for Middle Eastern situations. There is a lesson for humanity here as well: In the 13th and 14th Centuries the forest in this area was completely logged to provide charcoal for smelters producing silver and lead ingots. The removal of the trees exposed highly mobile glacial sands, which blew around enough to create dunes and soil too unstable for the trees to recolonize. This is a medieval ecological catastrophe. 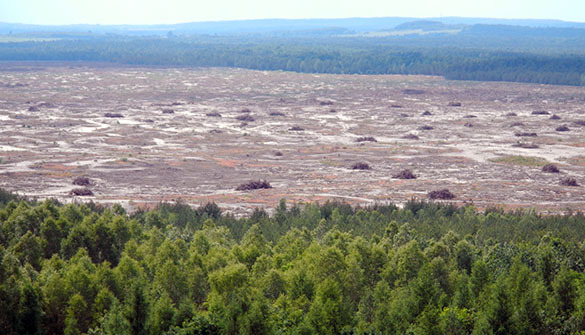 The Błędów Desert is now protected from human traffic so it has a chance to be absorbed back into the surrounding forests. Above is a radio tower in Gliwice, Poland. It is an impressive construction in its own right, being made of wood with brass connectors in 1935 by Germans. It is the second tallest wooden structure (118 meters) in the world. How it survived World War II is a mystery to me. 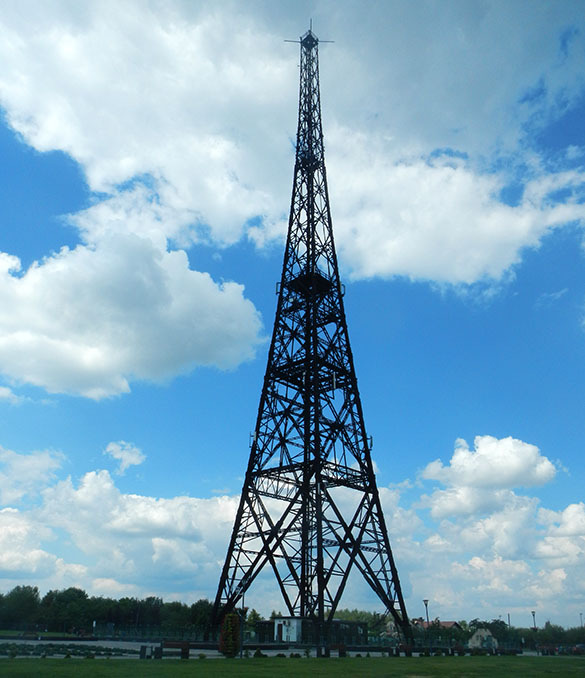 This radio tower is famous for being the site of the Gleiwitz Incident on August 31, 1939. At the time Gleiwitz was within Germany near the Polish border. German SS troops staged a bloody attack on the radio station and tower to make it look like Polish Silesian nationalists were responsible. This was at least conceivable because of the tensions in Silesia between Germans and Poles for centuries, especially in the year after World War I. Of course, the Poles had nothing to do with the Gleiwitz violence. 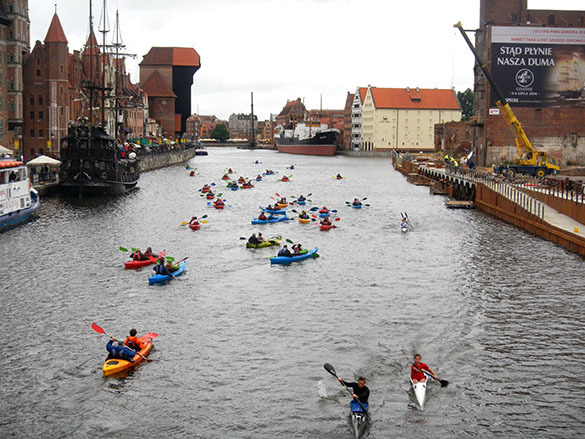 The Nazis used it as a pretext to attack and invade Poland on September 1, 1939. 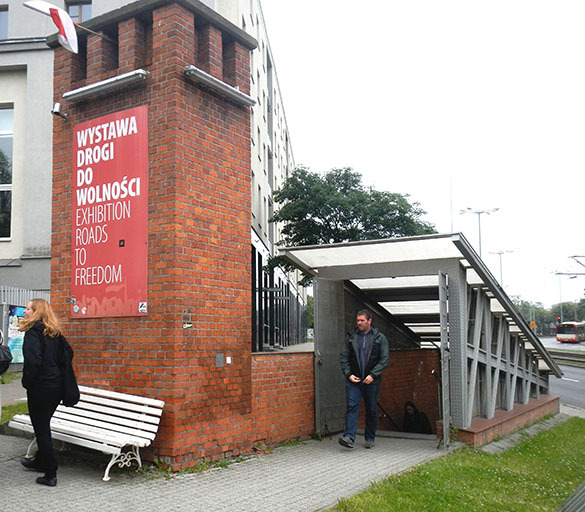 Last week my colleagues and I visited Westerplatte in Gdansk where the first “official” shots were fired. In some ways, though, the war started here. 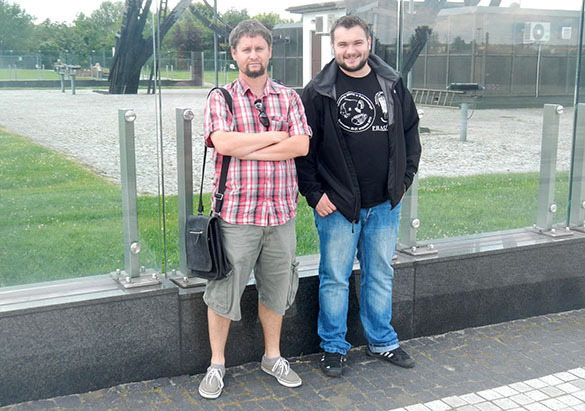 Here are my patient and friendly colleagues Michał Zatoń and Tomasz Borszcz at the base of the Gliwice radio tower. They are very tolerant of my passion for history and geology. Geology, of course, is so much our fundamental basis for being that we rarely think about it. Occasionally, though, particular geological circumstances play direct roles in history. 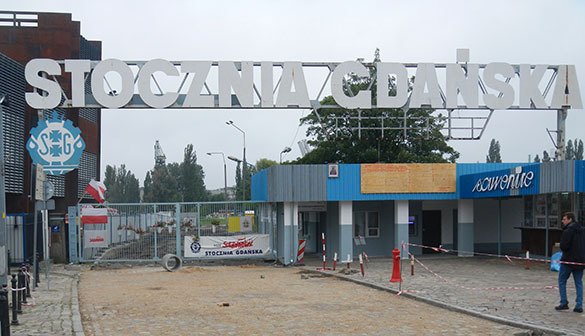 Today as I was visiting Góra Świętej Anny with my geologist friends I was intrigued by events that took place here in 1921 that provided another twist in the story that leads to the cataclysm of World War II. The image at the top is from Google Earth showing the low prominence of Góra Świętej Anny in the center. It is not particularly high (just 406 meters), but it dominates the surrounding low countryside of fertile fields, productive mines, and scattered factories. As noted in our previous blog entry, Góra Świętej Anny is elevated because it has a core of resistant basalt from an extinct Paleogene volcano. It was an isolated volcano (the furthest eastern exposed basalt in Europe) and thus forms an isolated hill. This is a view west from Góra Świętej Anny. The haze in the background is from large smokestacks on the right. 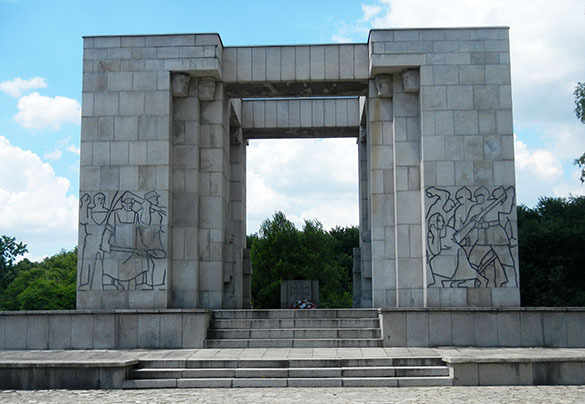 On Góra Świętej Anny is the above monument to Polish Silesians who rebelled against the Germans throughout history (Teutonic knights are portrayed on the right panel), particularly during a 1921 battle on this elevation. 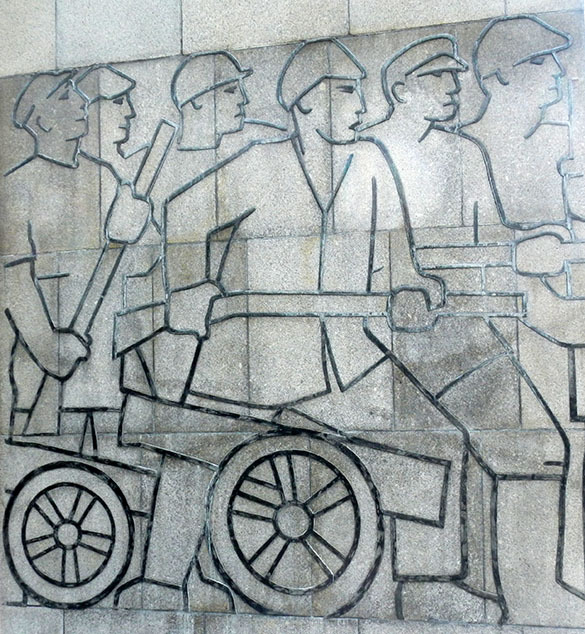 The monument was dedicated in 1955 during “communist times” and shows many elements of Soviet-style design. It contains within it ashes from Poles killed in the Warsaw Uprising in 1945, and it is on the site of a German mausoleum that was dynamited to oblivion during liberation in 1945. These lead outlines represent Polish workers advancing against German troops in 1921 on Góra Świętej Anny. It is a story too complex for a blog entry, but here was the Battle of Annaberg between German Silesians and Polish Silesians during the Third Silesian Uprising. The Poles had taken this hill and defended it against an attack of German Freikorps, which were essentially World War I soldiers who had refused to demobilize in the chaos following the Armistice. The Poles were eventually forced off Góra Świętej Anny at great cost to the Germans. Later international commissions then divided up Silesia between Germans and Poles, with this area falling to the Germans. 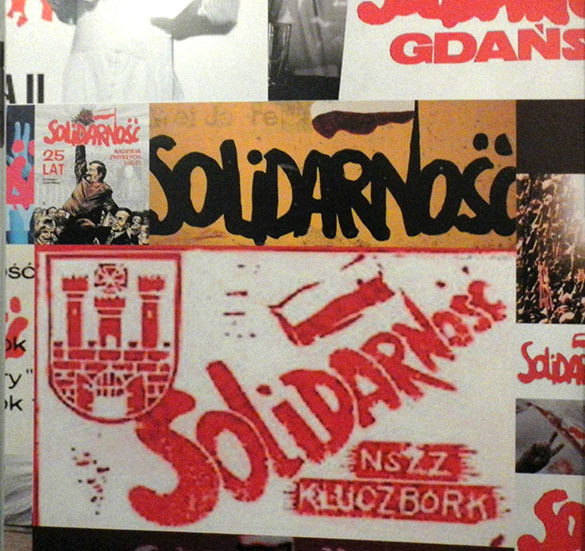 Polish Silesians, of course, took this very hard and continued to resist the Germans. Tension in this area eventually fed into pretexts for the German invasion of Poland in 1939, the start of World War II. 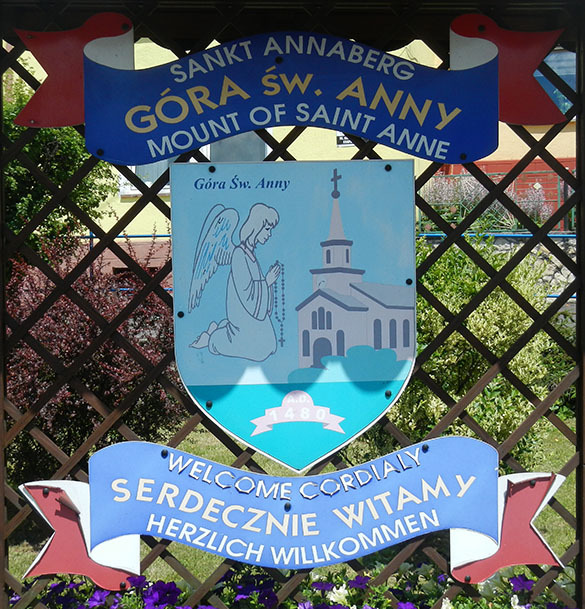 German nationalists, many of them early members of the Nazi Party, wanted to make Góra Świętej Anny (or Annaberg, as they called it) a kind of shrine to their past and future efforts to make Silesia part of the Reich. 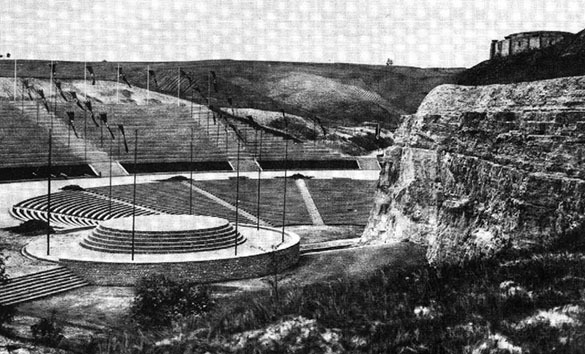 They built a mausoleum (seen in the top right in this pre-war image) and a large amphitheater called a Thingstätte. The idea was to have Nazi rallies here with the dead from 1921 elevated above in some sort of Valhalla. The excavation of the amphitheater is what exposed the Middle Triassic Muschelkalk rocks for our study today. 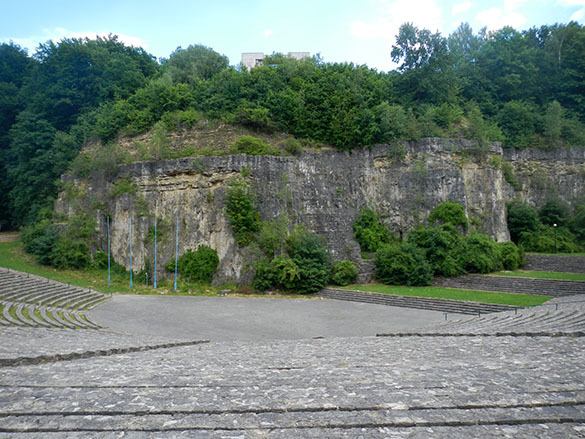 The amphitheater today survives for Polish festivals (it is a delight to hear the ring of schoolchildren’s voices here) and visiting geologists. 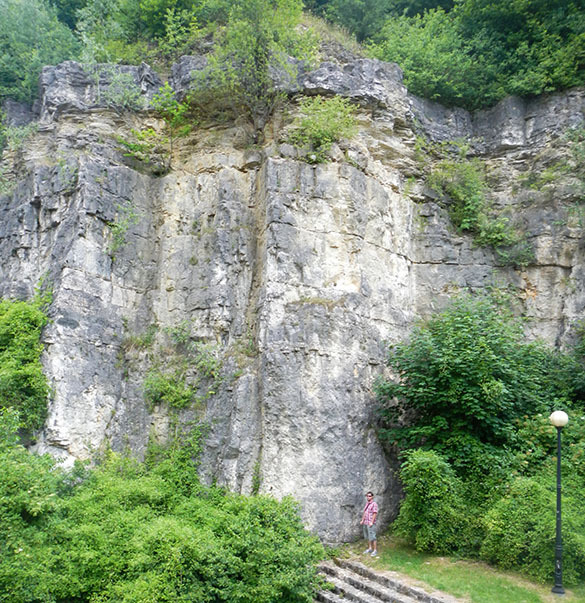 (It is part of a geological interpretive trail). At the top of this view is the 1955 Polish monument on the site of the destroyed Nazi mausoleum. 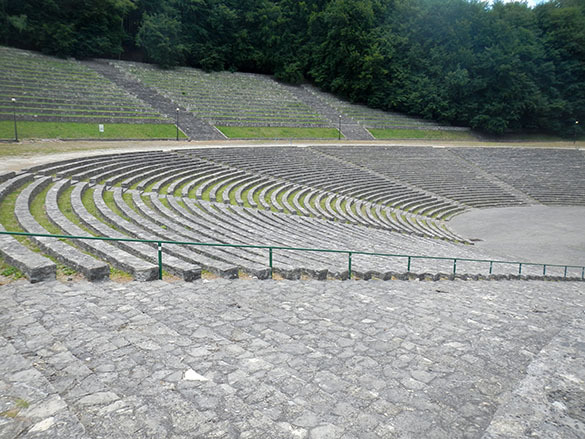 The Germans cut most of the trees of the area down when they made the amphitheater. The Poles have allowed the forest to return. There is something profound about the peaceful, natural healing this reforestation represents. SOSNOWIEC, POLAND — My friends Michał Zatoń and Tomasz Borszcz took me on a very pleasant day trip to Góra Świętej Anny in southwestern Poland about an hour’s drive northwest from Sosnowiec. This is a place of considerable geological and historical interest. It is an eroded volcanic caldera and the easternmost occurrence of the fine-grained igneous rock basalt in Europe. You would think I’d be able to show you at least a bit of basalt, but we saw only the surrounding Middle Triassic limestone country rock. (Sorry, Dr. Pollock.) We’ll talk about the history later. Now we’ll look at the geology. 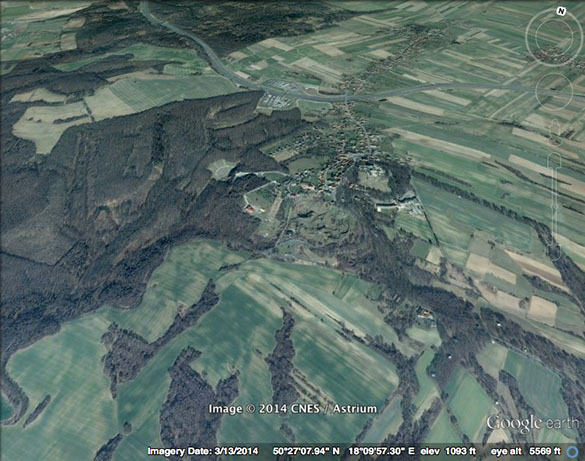 Here is a great exposure of the Muschelkalk, a Middle Triassic sequence of limestones and dolomites that extends across central and western Europe. This is its best exposure in Poland. The rock appears very massive in this old quarried wall, but it actually has many distinct layers. Michał is standing at the top of stairs that lead down into a massive Nazi amphitheater called a Thingstätte, but more on this later. 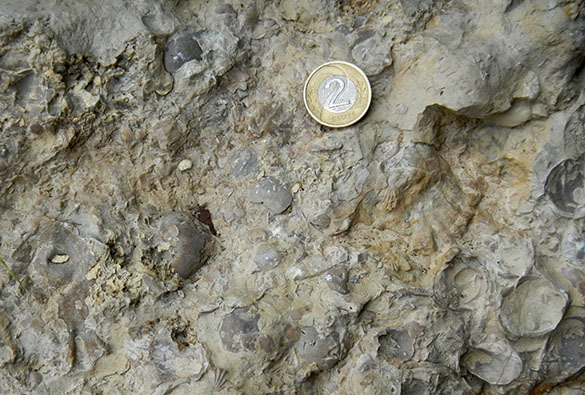 Part of the Muschelkalk unit is dominated by terebratulid brachiopods, many of which are seen on this slab. The topmost Muschelkalk here contains thick beds made primarily of crinoid skeletal debris, a kind of deposit known as an encrinite. We’ve seen encrinites before in this blog. You don’t often see informative signs dedicated to the description of a trace fossil type. 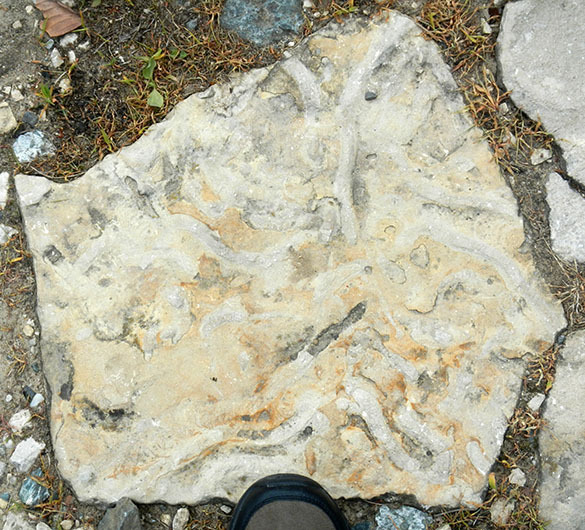 Rhizocorallium commune is the most common ichnofossil in this part of the Muschelkalk. It is a ropy, loopy tube produced in this case by crustaceans, probably including the decapod shrimp Pemphix. 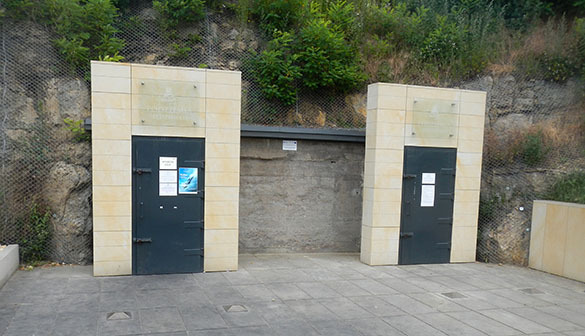 The slabs used to pave the walks and plazas in this area are filled with Rhizocorallium commune traces. Finally, this is a view west from Góra Świętej Anny towards the Oder River. It is the highest place around, dominating this fertile valley rich with farms, mines and factories. 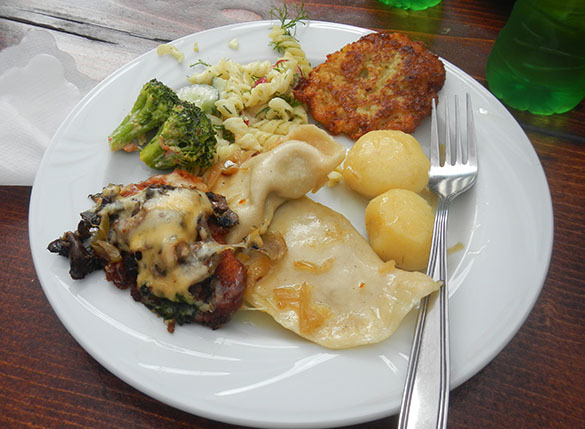 This will be the reason it is so culturally and historically significant in Silesia. 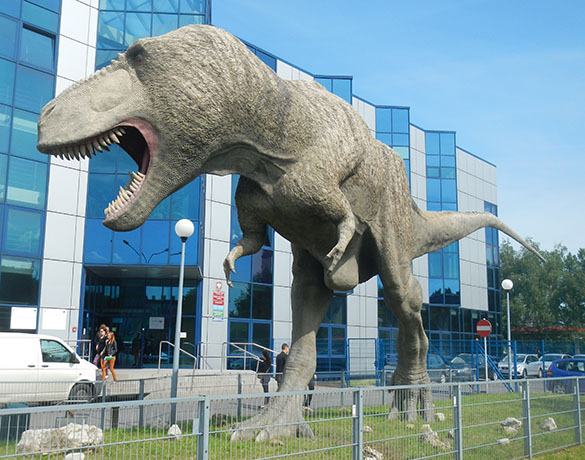 SOSNOWIEC, POLAND — The above full-scale model of Tyrannosaurus rex is one of my favorite dinosaur reconstructions. 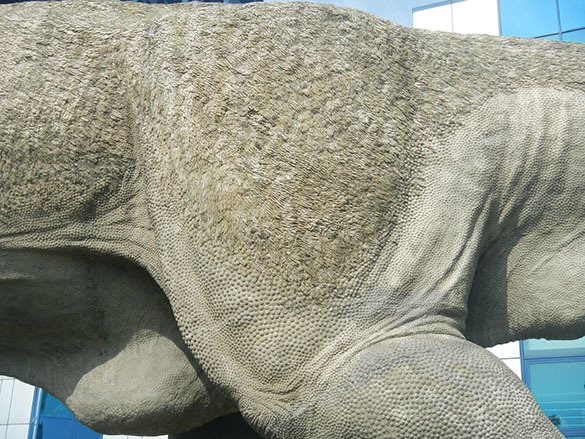 It sits in front of the Earth Sciences Building at the University of Silesia. Since it is outside the lighting is always dramatic, and the artists paid close attention to even tiny details like the reported coat of downy feathers on its back (see below). The roughening you see in the upper half of the image represents the feathery covering. We can only imagine what colors were present in the original. Here is a new Polish colleague I met this morning. Alina Chrząstek is a paleontologist at the University of Wroclaw. 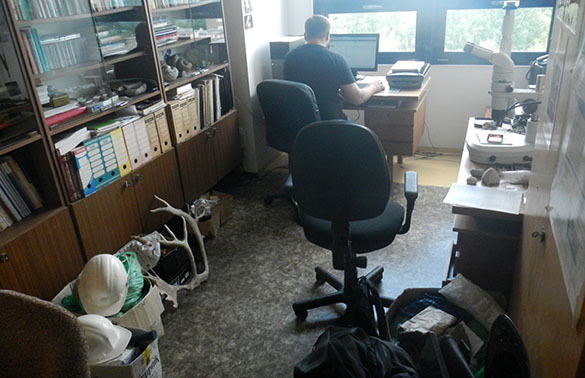 She is a specialist in invertebrates and trace fossils. A few months ago she sent me photos of rock and fossil specimens she had questions about, and I told her we could meet when I was in Poland. 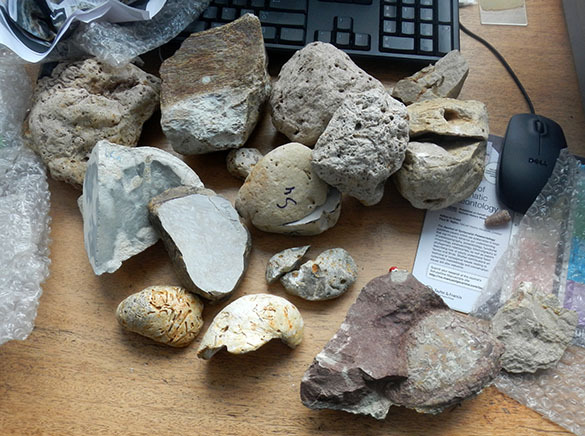 She came today with boxes and bags of specimens, a few of which are shown below. 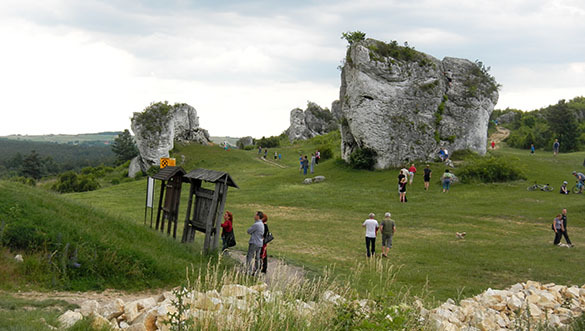 These are glacial erratics from a moraine in southwestern Poland. They are rocks of a variety of types and ages scraped up by glaciers in the north and deposited in the south. Alina is sorting through what fossils are in them. It is a fun collection because it contains rocks from the Cambrian to the Cenozoic, with all manner of trace and body fossils. 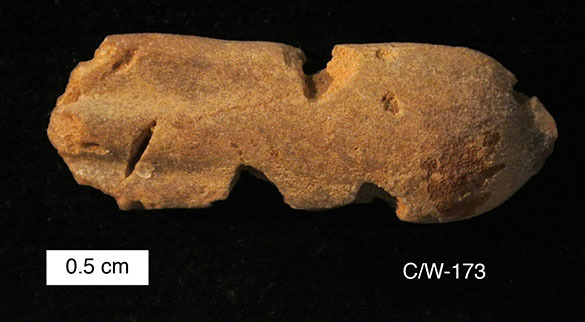 They can be quite a challenge to identify because the stratigraphic context is gone. 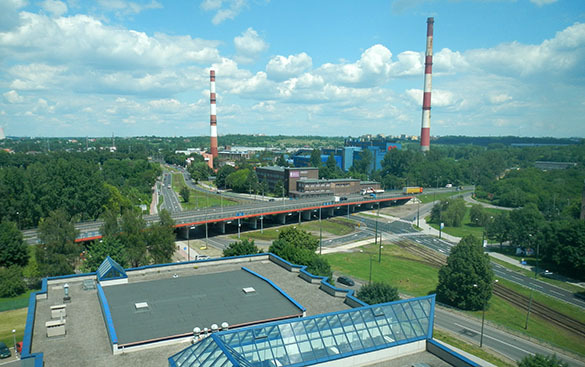 SOSNOWIEC, POLAND — Today my friend and colleague Tomasz Borszcz and I had a ten-hour train trip from Sopot to Sosnowiec in southern Poland. 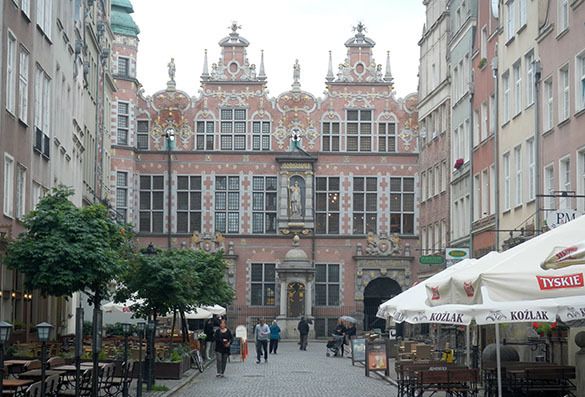 Our destination was the University of Silesia to meet with Michał Zatoń for research. 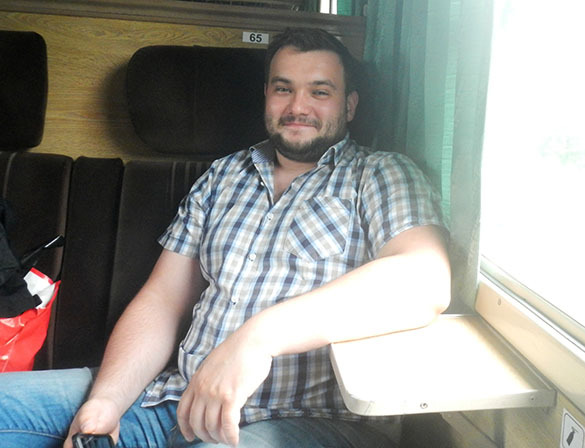 I didn’t see any inspiring scenes from the train window, so I photographed Tomasz sitting opposite me. We had excellent conversations about many scientific topics of mutual interest. I was grateful for both his companonship and skills in knowing where this mysterious train was at any given time. 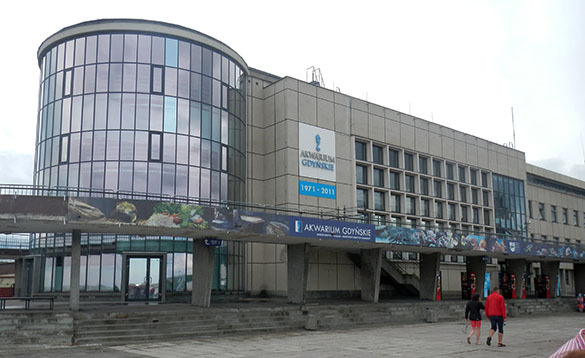 SOPOT, POLAND — After lunch today the Larwood 2014 meeting participants had an excellent field trip to the aquarium in Gdynia on the Baltic coast (above). This aquarium has a diverse and interesting collection, but for me the two historic ships docked alongside were just as fascinating. 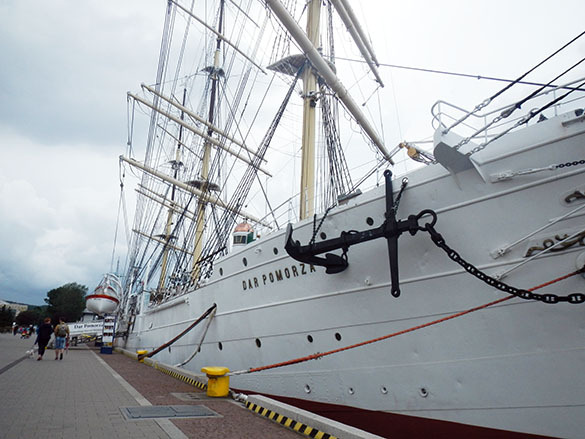 This is the Dar Pomorza, a fully rigged ship built in Hamburg, Germany, in 1909 as the Prinzess Eitel Friedrich. It was used as a training ship in the Baltic Sea by the German Navy, and then surrendered to France in 1919 as part of reparations for World War I. 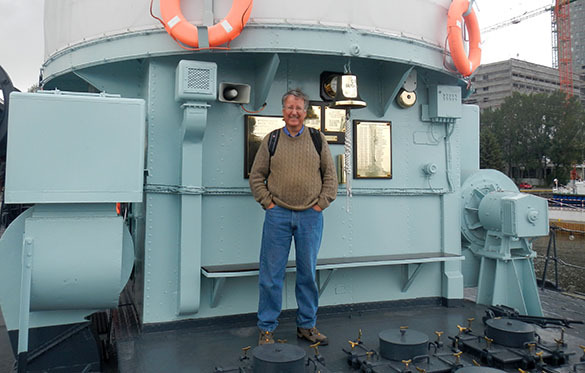 The Polish bought it as a training ship for naval cadets in 1929, adding a diesel engine. 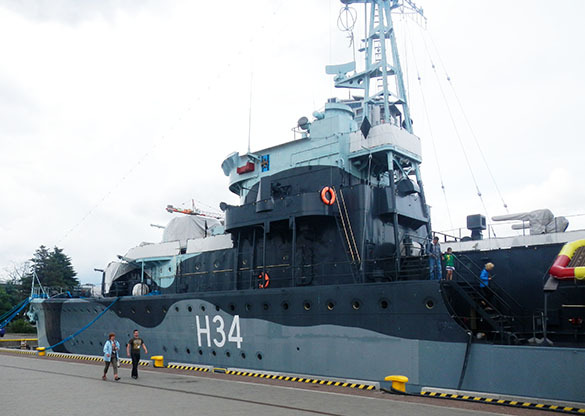 It was interned in Stockholm during World War II, returning to Polish service in 1946. It became a museum ship in 1983. 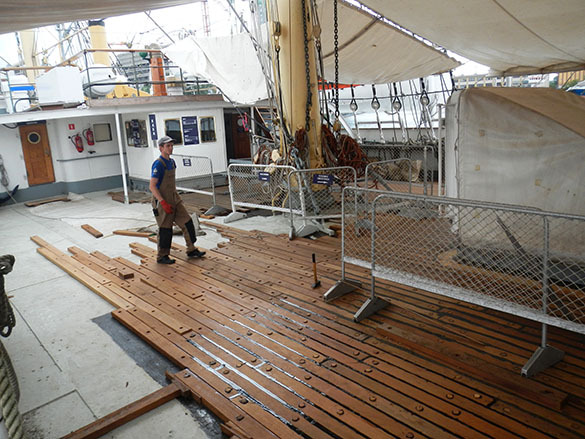 The Dar Pomorza is being refurbished, so we had only this close view of new planking being laid on the deck. This magnificent ship (above and below) had a long and distinguished career in World War II. 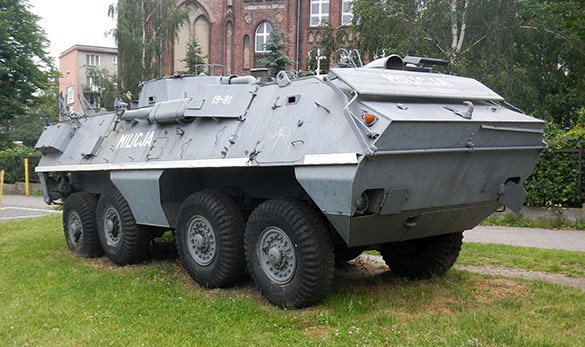 It is the Błyskawica, which means “lightning” in Polish. 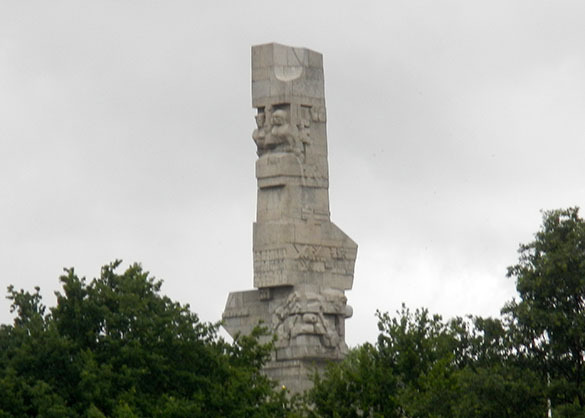 It was built in 1935-1937 by a British firm on contract for the Polish government. 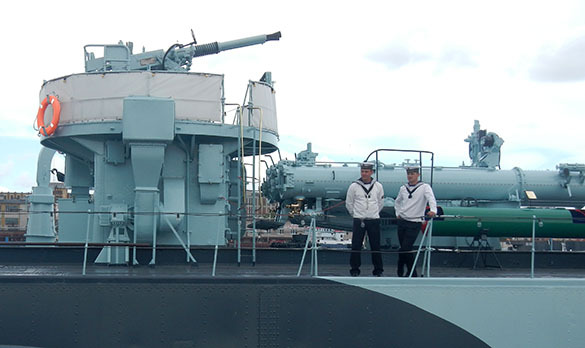 On August 30, 1939, the Polish Navy secretly evacuated this ship along with two other destroyers to Great Britain just before the Germans invaded Poland. It was thus able to participate in the war against the Germans throughout the North Sea, Atlantic and Mediterranean. It covered operations in Norway, the evacuation of British and French troops from Dunkerque, and the Allied landings in both North Africa and France. It must have been deeply satisfying for the Polish sailors on board the Błyskawica to be able to fight back so long and effectively against the Nazis. Polish sailors by an anti-aircraft gun and torpedo tubes. 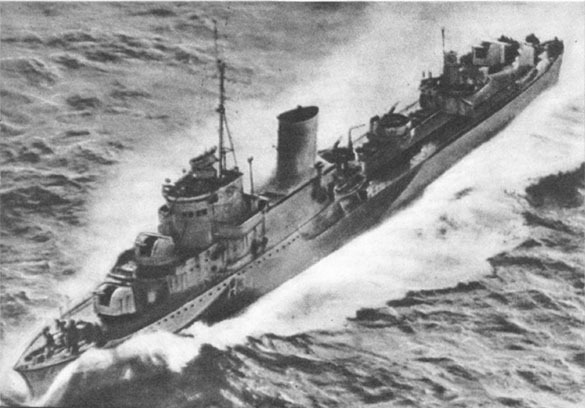 The Błyskawica in the North Atlantic during the war. I couldn’t resist. Thanks to my friend Tomasz Borszcz for taking this photo on the Błyskawica.